Au Chocolat spans such a vast area that we were impressed before we even stepped in. Walking into what seems like a wonderland with pretty colours and stuffed toys, it's inevitable that one gets lost staring at the sea of breathtakingly pretty desserts. 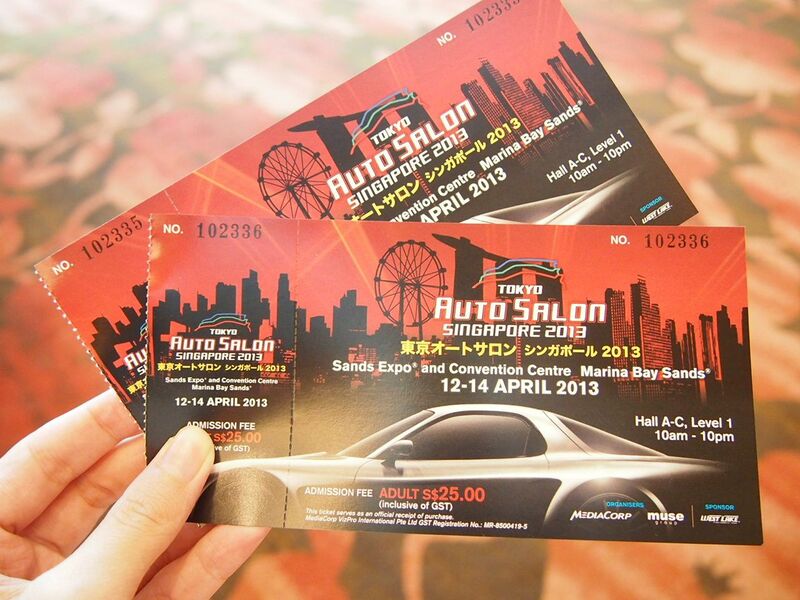 Tokyo Auto Salon has been going on for 30 years now, but this is the first time that it's in Singapore. Held at the iconic and prominent Marina Bay Sands, this showcase of unique cars and fast cars attracted huge crowds over a period of three days. Lim Seng Lee Duck Rice Eating House has been flooded with customers ever since news of their closing in June hit the entire nation. 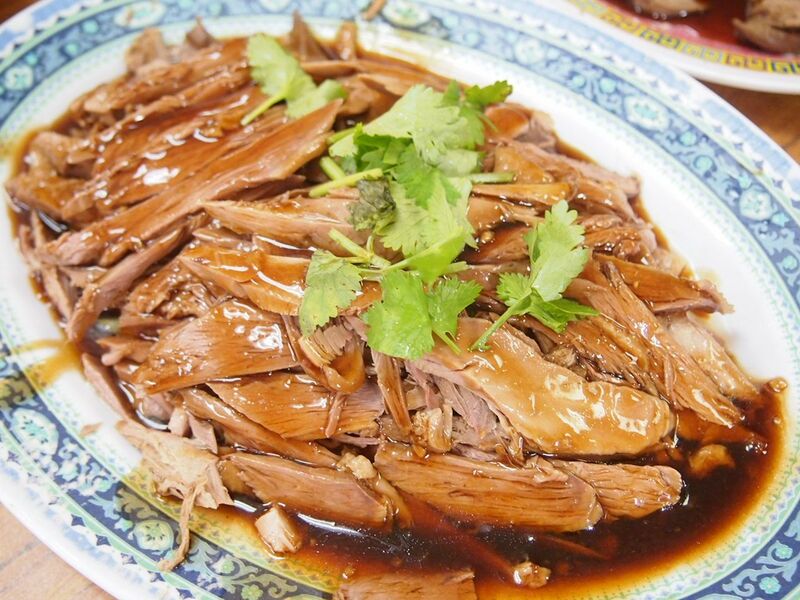 Lim Seng Lee was one of the first to serve boneless duck in Singapore and they have been around for 45 years so, as expected, their impending closure has saddened many and, especially, their loyal customers. 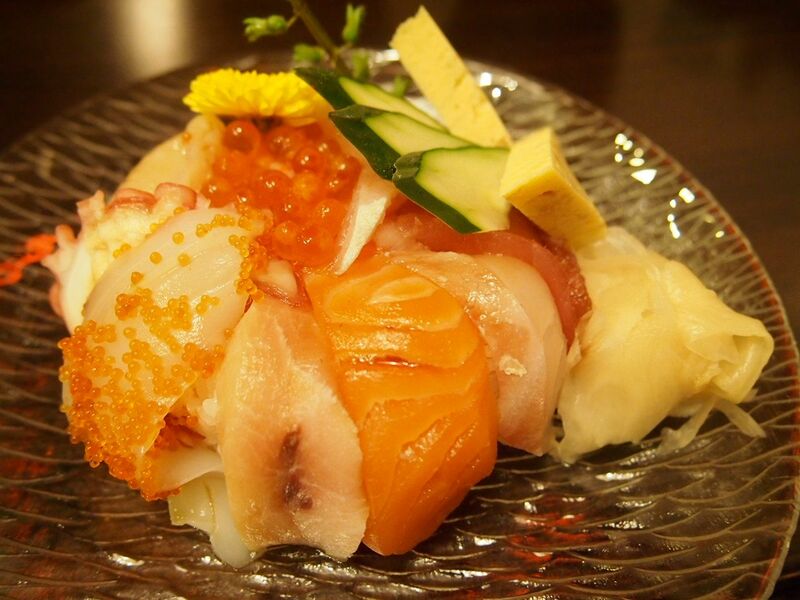 Tenryu Dining & Tea House has been around for about one and a half years now. Located in the huge Dairy Farm Estate, Tenryu sits along a quiet corridor near the pool. The biggest name in the history of macarons has arrived in Singapore! 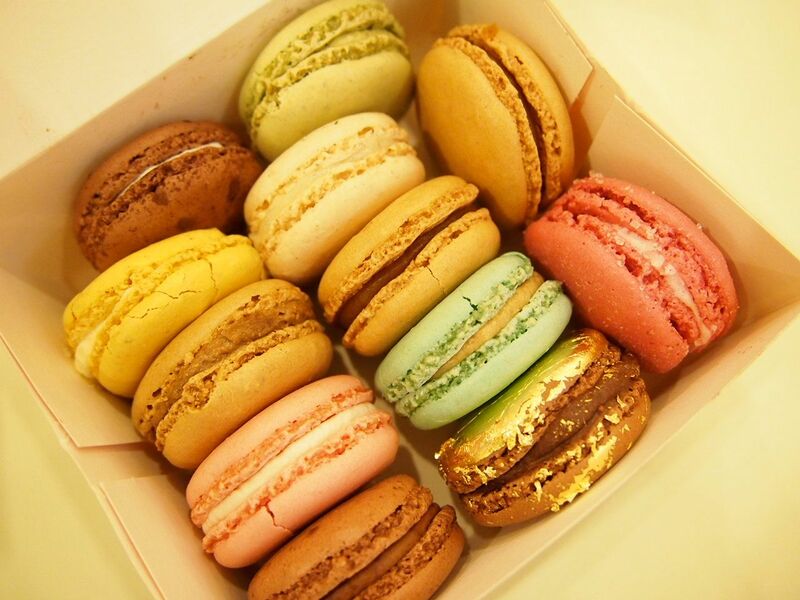 Widely know as the creator of macarons, Laduree has brought its famous macarons with a history of 80 years, to one of the biggest shopping malls in town. 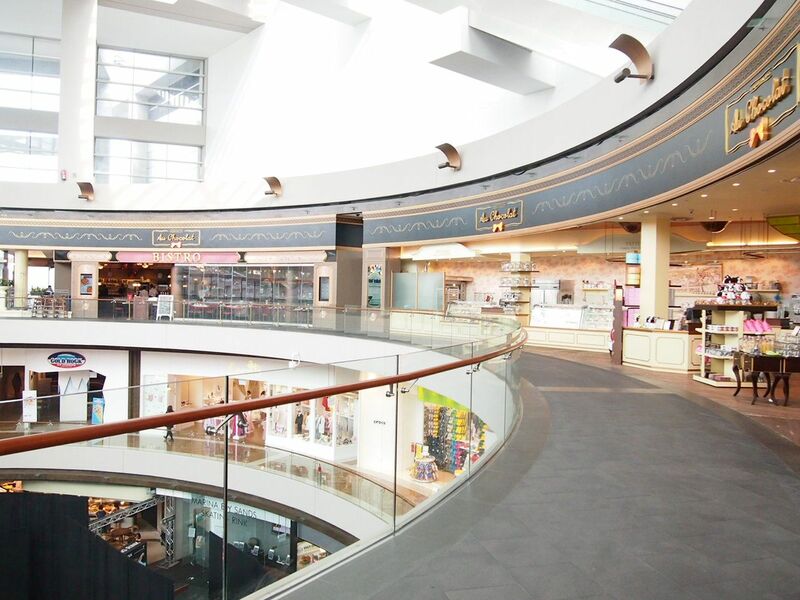 Located in Ngee Ann City, Laduree has a boutique on the second level and its take-away counter on the first is the new neighbour of high-end French boutiques Chanel and Louis Vuitton. 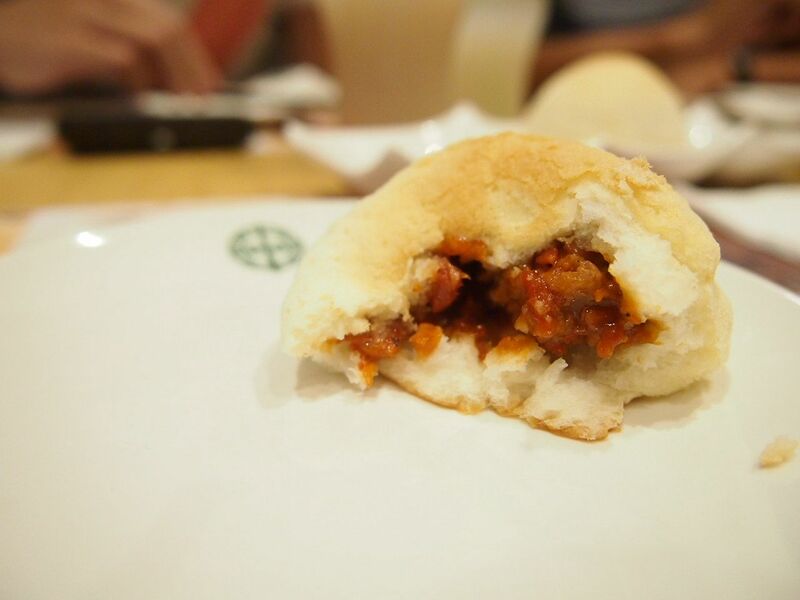 The hearts of Singaporeans skipped a few beats when they heard that one Michelin-starred restaurant, Tim Ho Wan, was opening in Singapore. Social media platforms were flooded with this piece of good news. 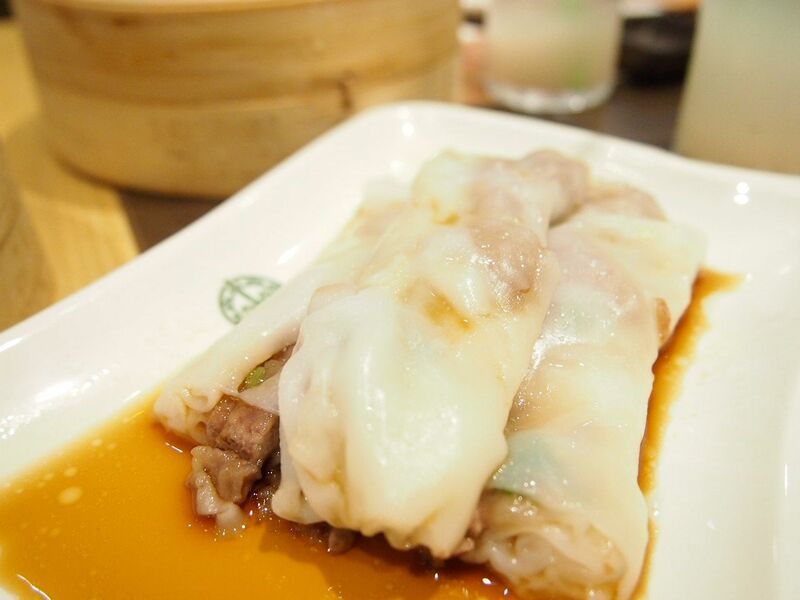 The highly anticipated opening of Tim Ho Wan was marked in the calenders of all foodnatics and dimsum lovers and long queues were, of course, expected. 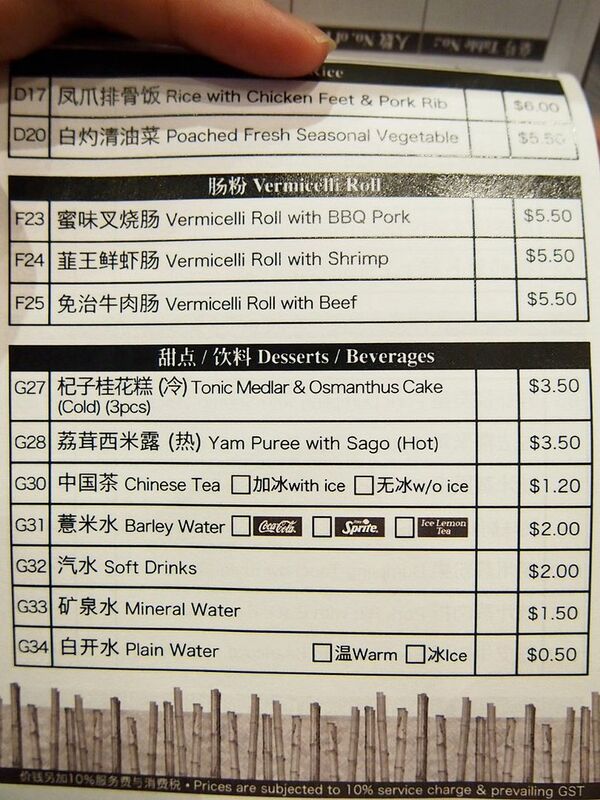 Their fourth heavenly king, the steamed egg cake, wasn't available then. Quite a thick and rich cup of barley. The food took awhile to arrive. 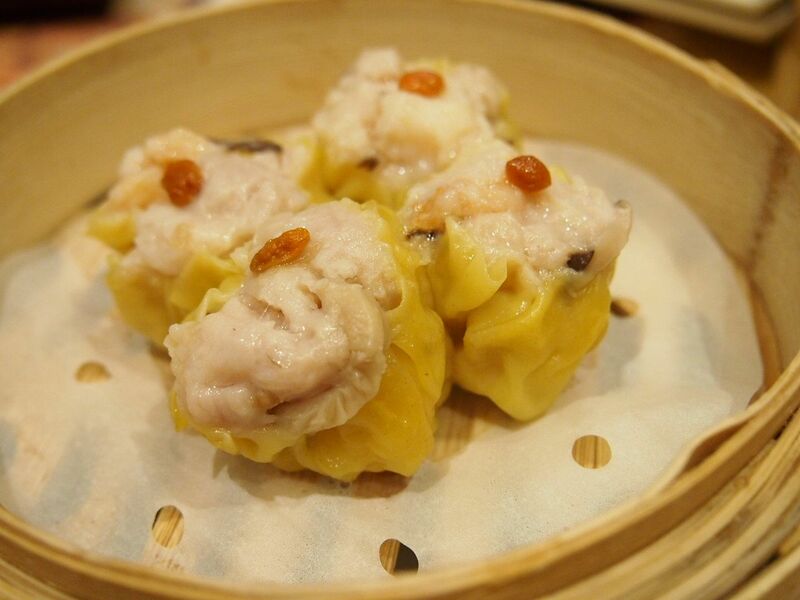 Fat, juicy and fresh prawns encased in a thin skin that were pretty satisfying. The spring rolls looked promising and they were lightly fried and very crispy. 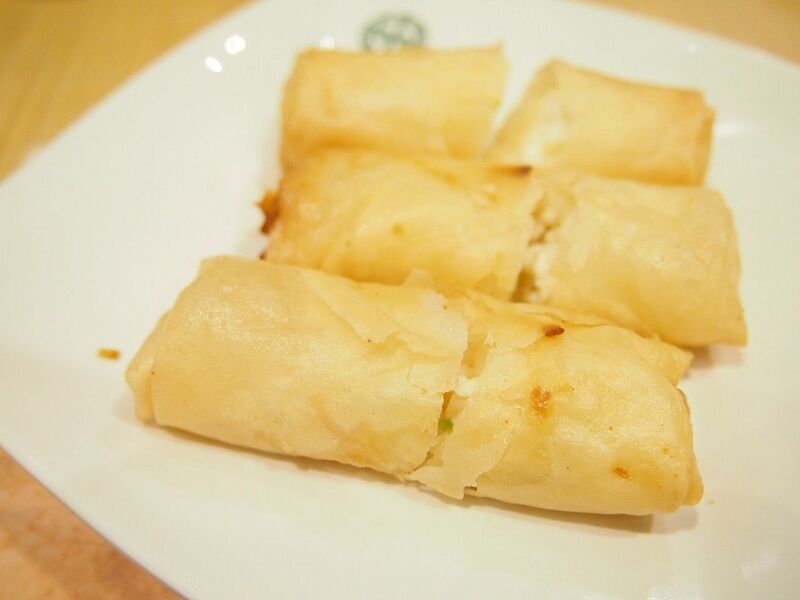 Loud crunches could be heard when we all bit into the spring rolls but disappointment hit us soon after as the tasteless egg white touched our palates. This was my second favourite dish of the lot! The big chunk of pork, mushroom and shrimp mixture was chewy, delicious and outstanding. 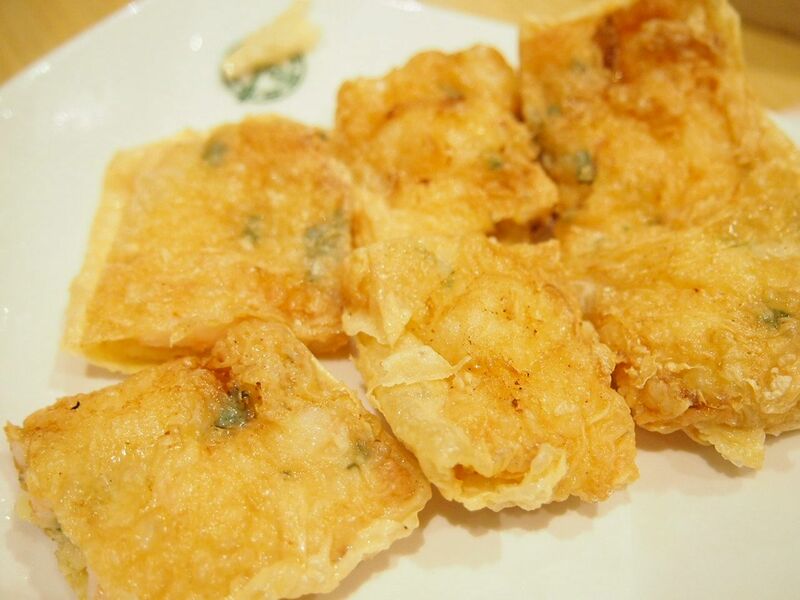 I don't really like siewmais but I have to admit that these were really good! I'm not a fan of pig's liver but I have to say that I actually liked this one! 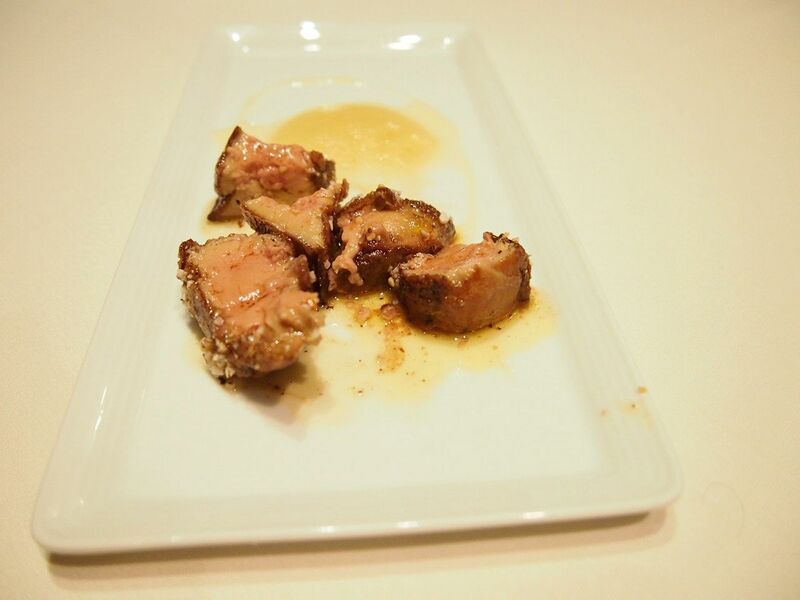 The pieces of pig's liver were extremely soft and they do not really possess the strong "iron/metal" taste! 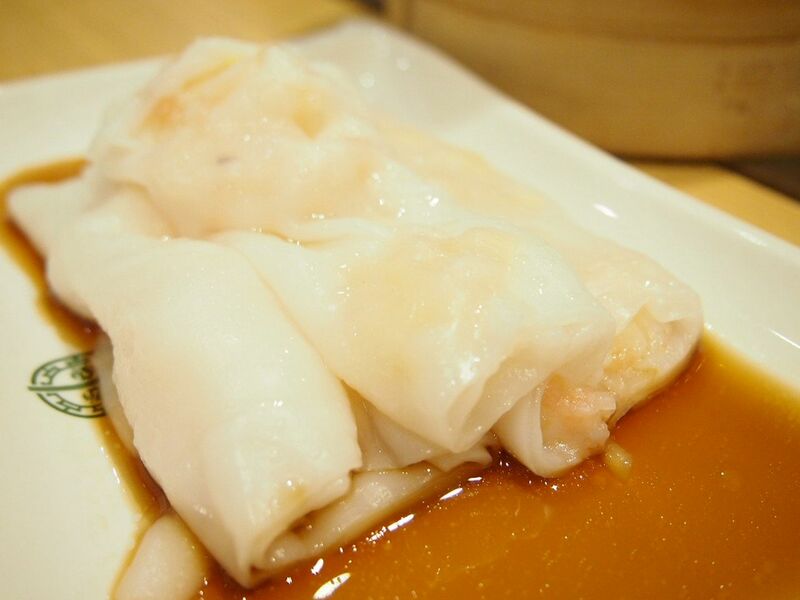 The vermicelli roll had quite a good portion of shrimp in them. We could have used a little more sauce though! 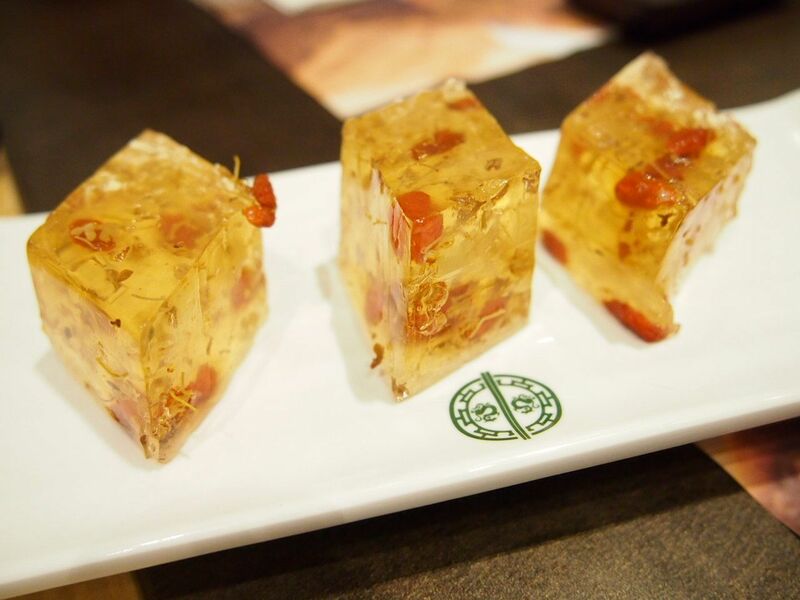 Jelly like blocks with a strong floral and herbal taste that didn't quite tickle my taste buds but X and his friends enjoyed it! 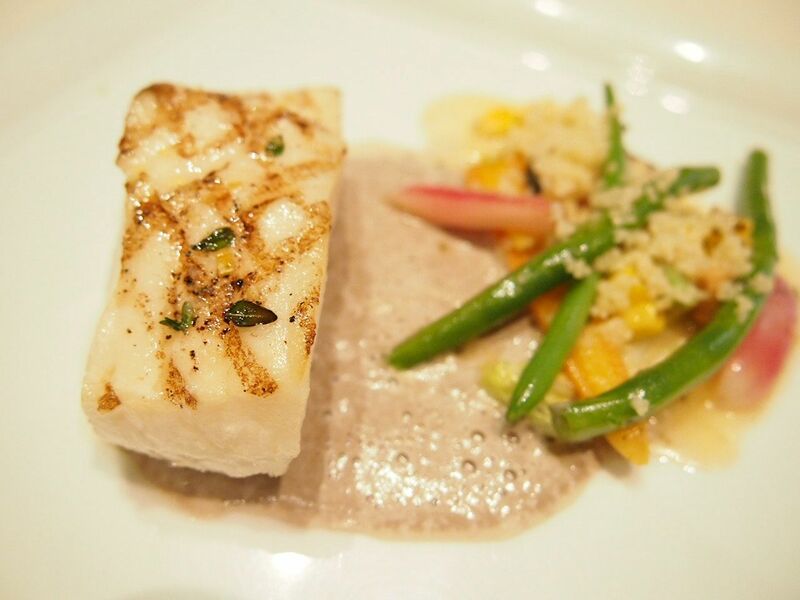 The texture of the yam puree was not what I had expected it to be. 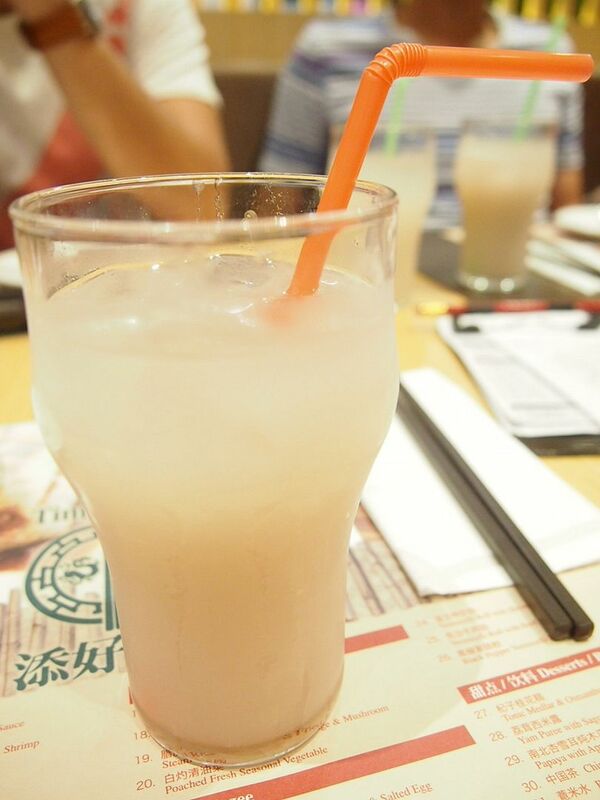 It was more like yam-water or something. 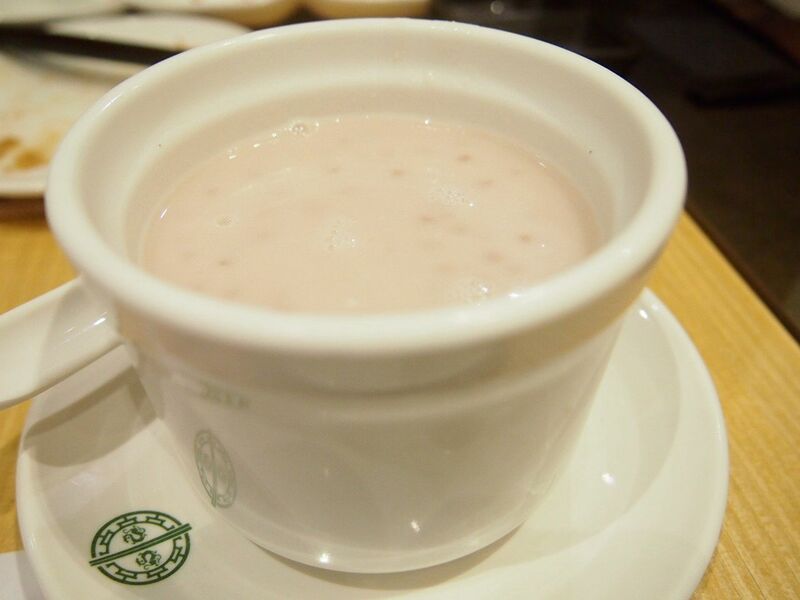 It was super fluid and the taste of yam was minimal and it seemed like the dessert was diluted. 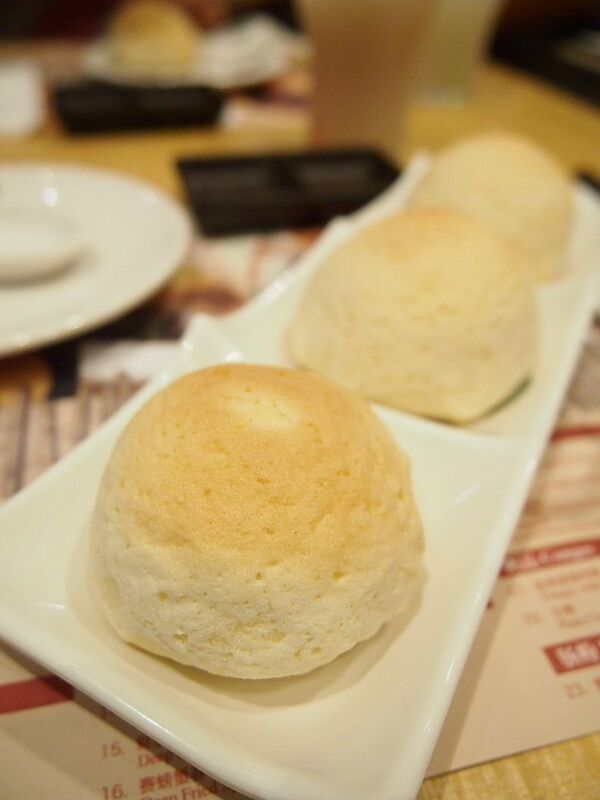 We had quite a disappointing experience at Tim Ho Wan. I guessed we had expected better, with all the hype and long queues. 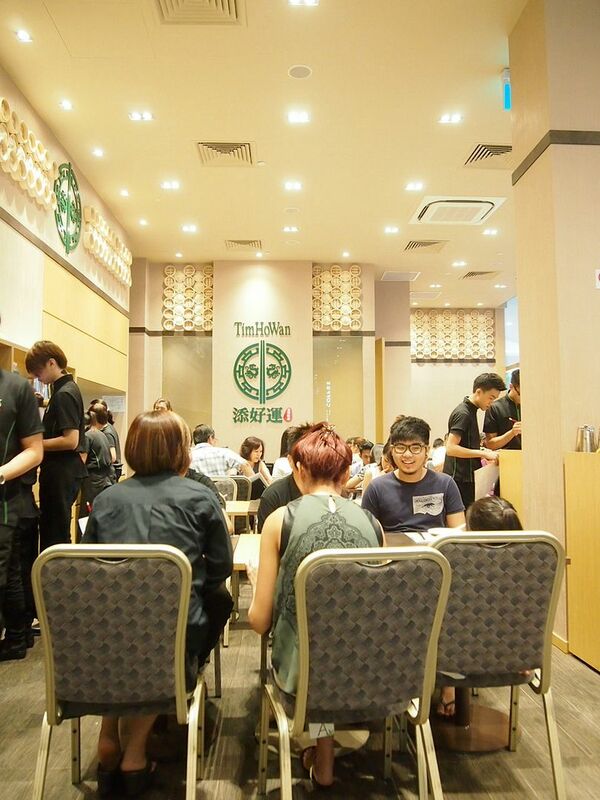 Also, our breakfast at Tim Ho Wan stretched from 10am to 1245pm due to a strange policy that they have. 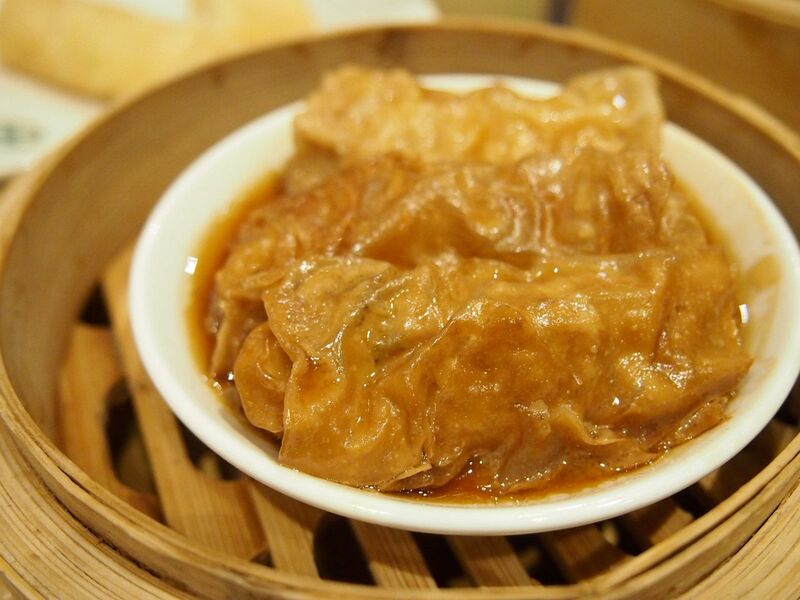 If diners want to order a second round of dimsum, they will have to wait for 45 minutes or more. We were fine with waiting, but its strange seeing items that we have ordered being served to the new diners who had just placed their orders. 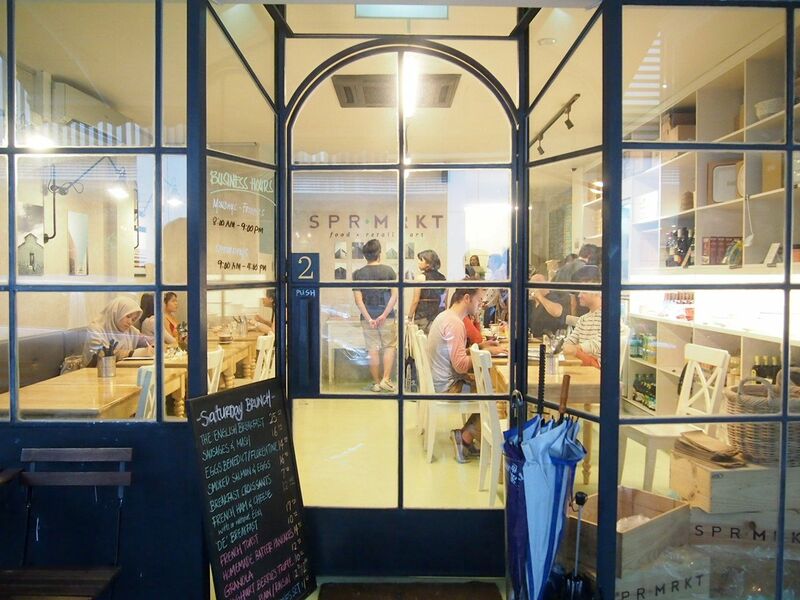 We thought that perhaps it's their way of regulating the crowd, by encouraging diners to leave. 45 minutes later, we checked on our order and apparently, it was not keyed into the system. 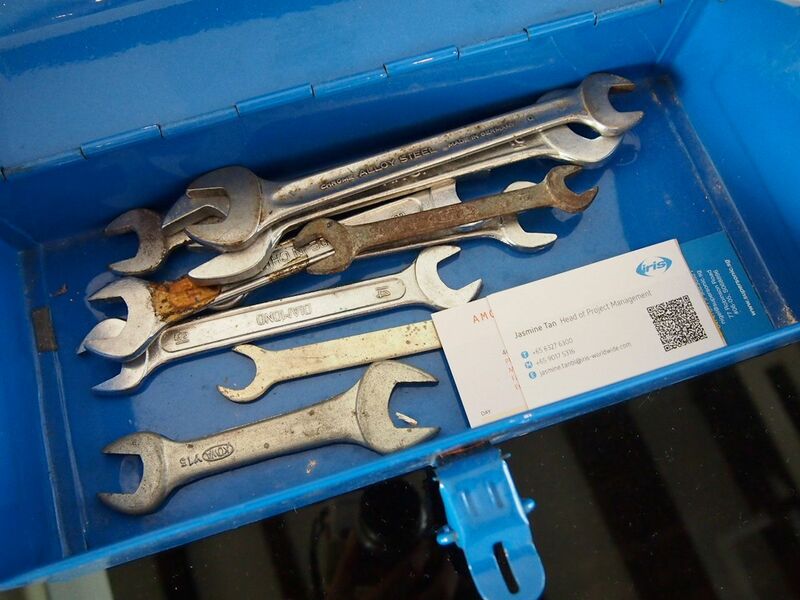 We asked a few servers about it and they told us that they will try their best to fix it. In the meantime, we just see dishes that we have ordered being served to diners next to us. 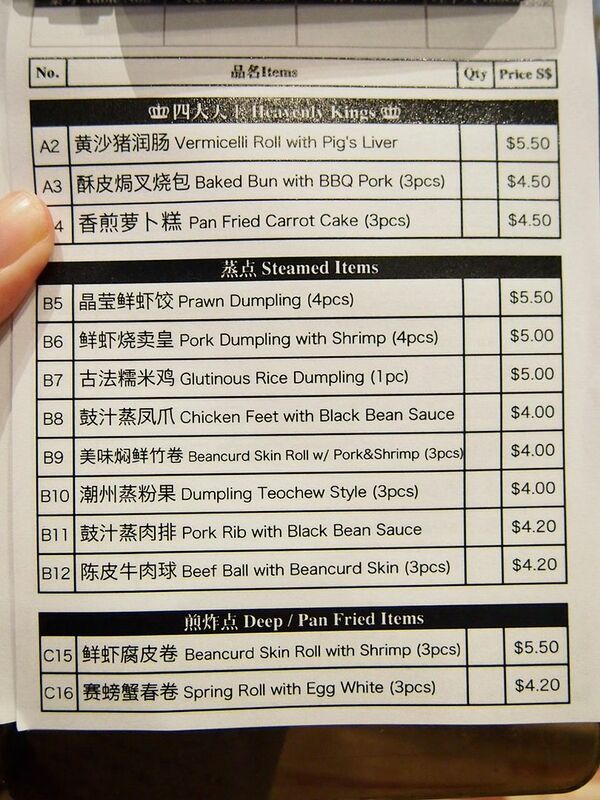 So we decided to cancel our order except for the dessert and another plate of char siew bao. Our orders finally arrived at 1230pm. Needless to say, we were not at all pleased with the service. 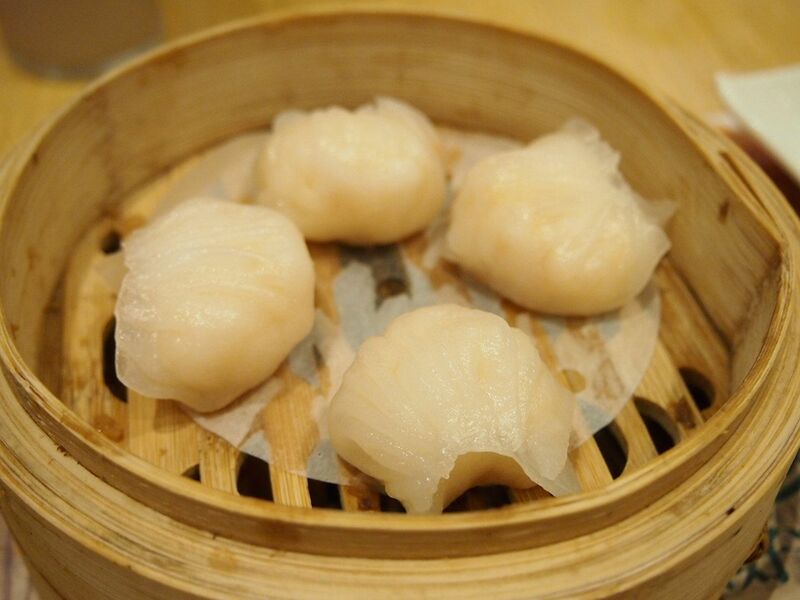 If you really want to try the dimsum at Tim Ho Wan, we suggest that you wait for this initial hype to die down and for them to have properly settle down before you visit. 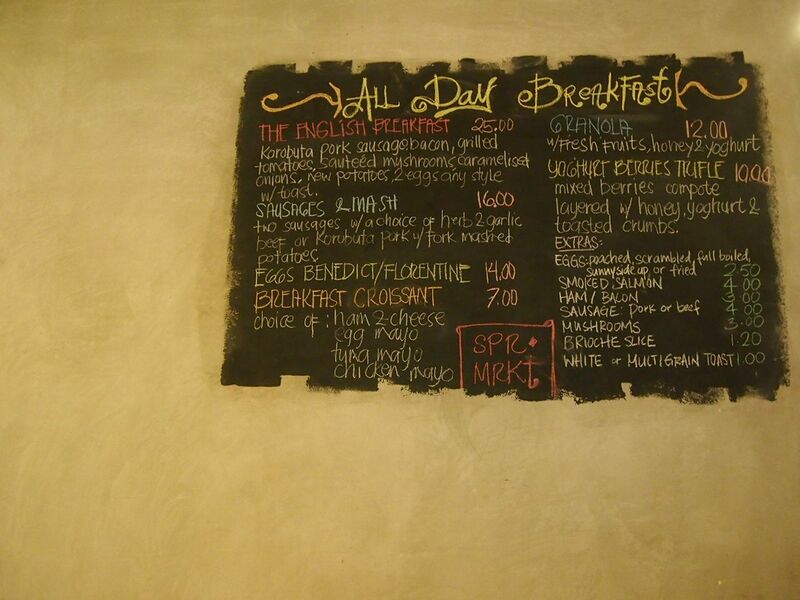 Rustic cement walls with paint and chalk. 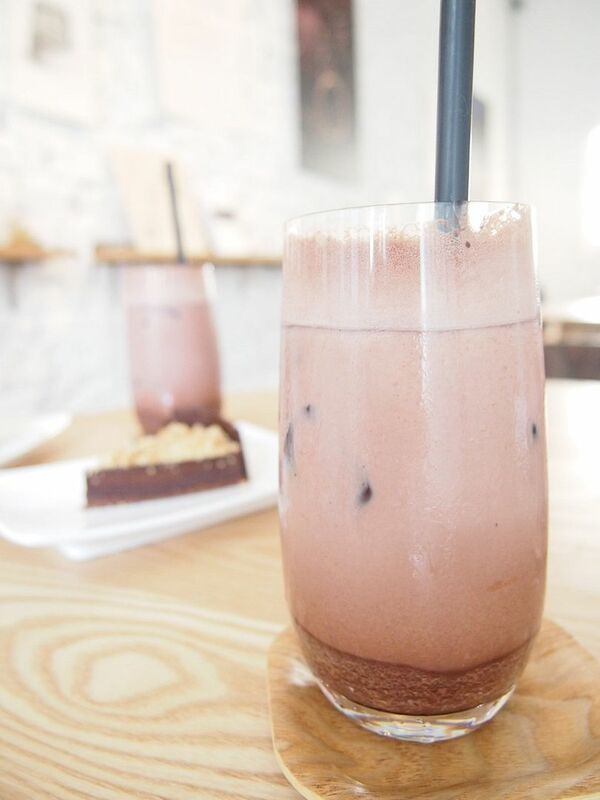 The cafe carries a laidback vibe that I really like. 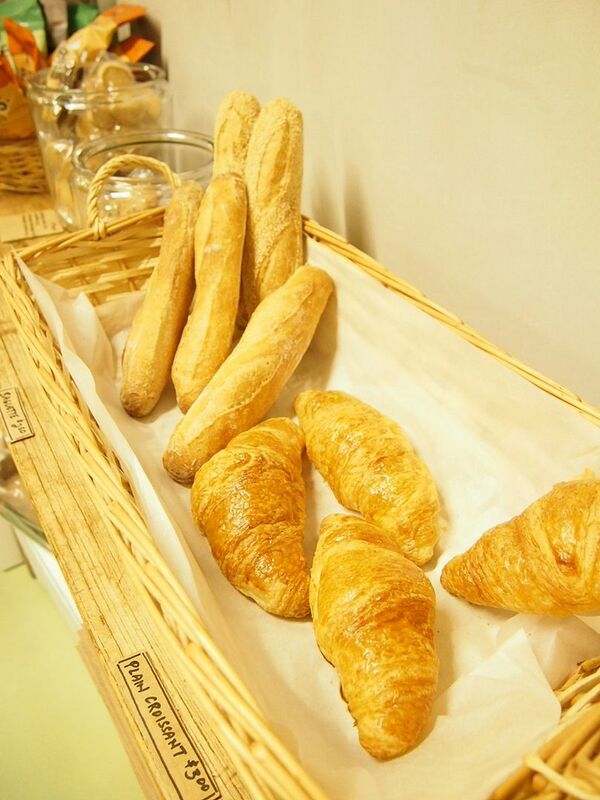 Here's a peek of what the cafe has to offer. They have desserts such as salted caramel brownies and pear tarts too. 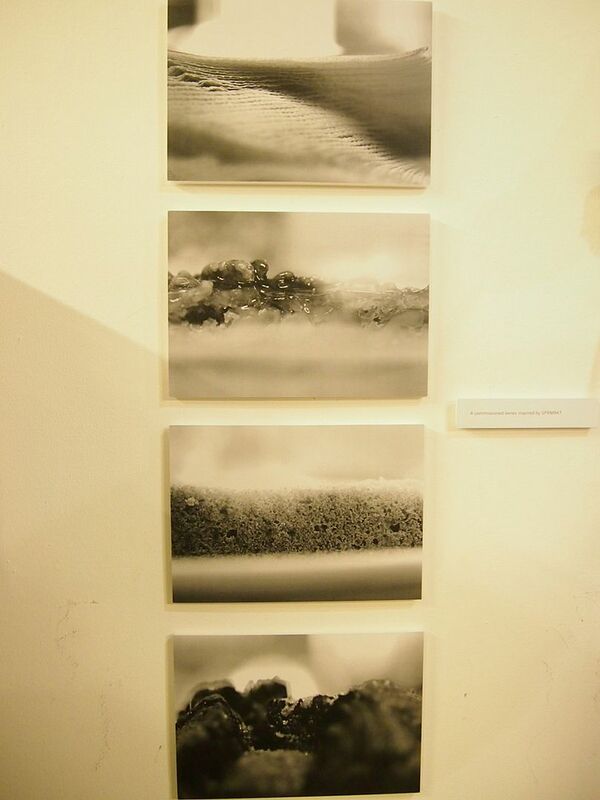 The art showcase revolves around two main themes. 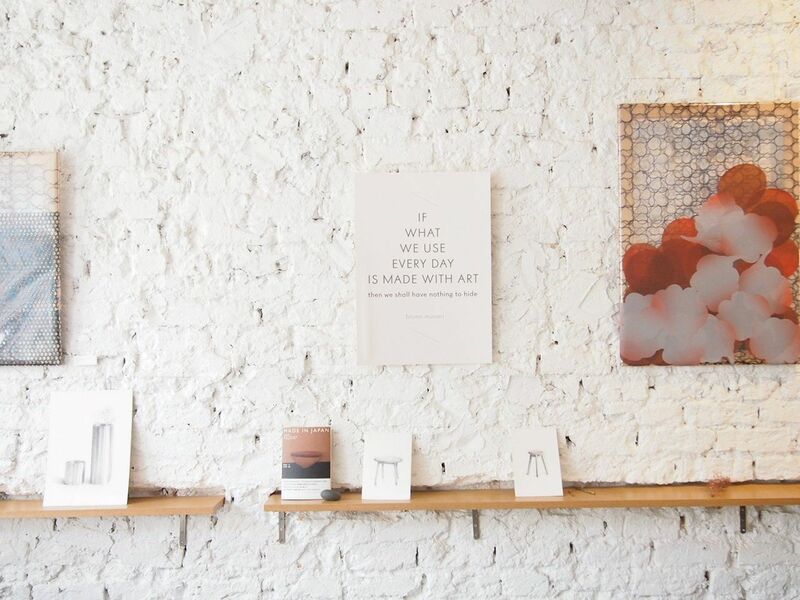 The themes are Fine Art in Architecture and, Fashion. That's Mr Akai Chew in white, holding a print of his work. 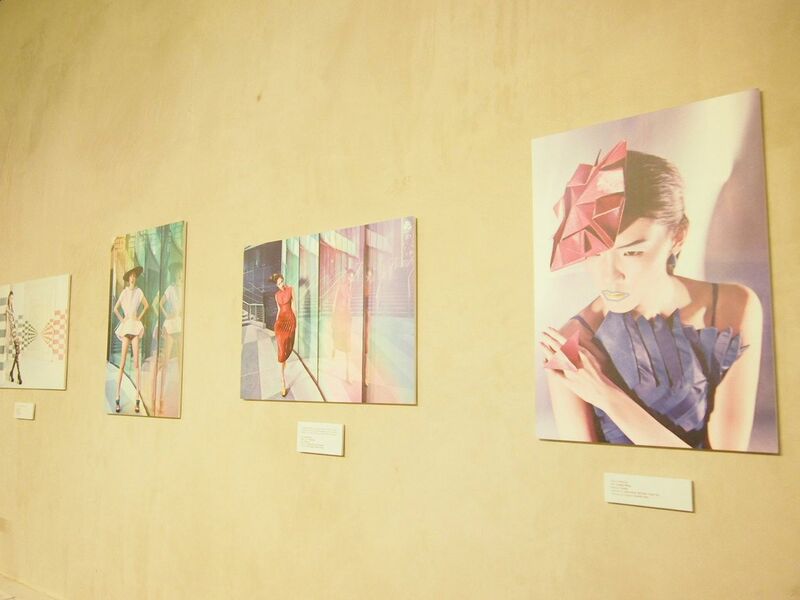 This is his first art showcase and I must say the photographs belonging to the fashion theme are pretty impressive. Love the smart play of colours! 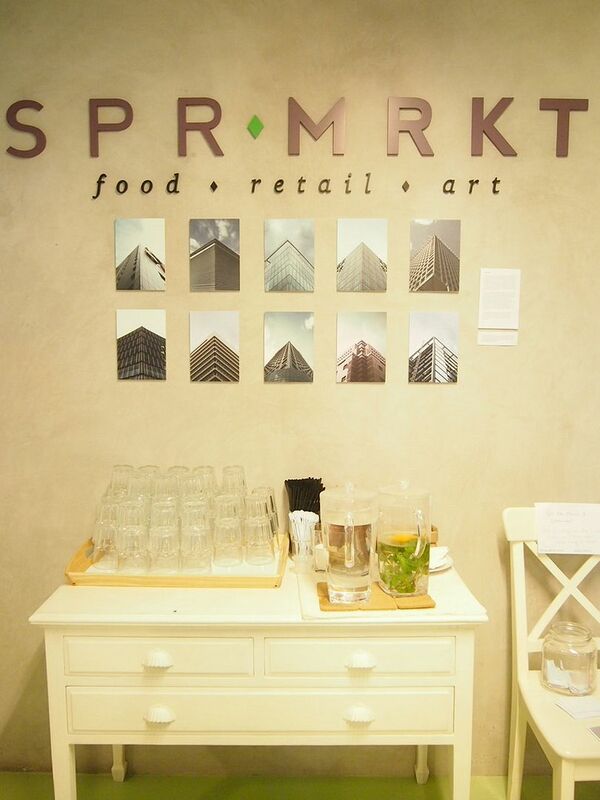 You can catch his works at SPR MRKT! I'm sure everyone knows these sweet little French confections that come in a wide range of flavours and colours. However, do you know what they are called? 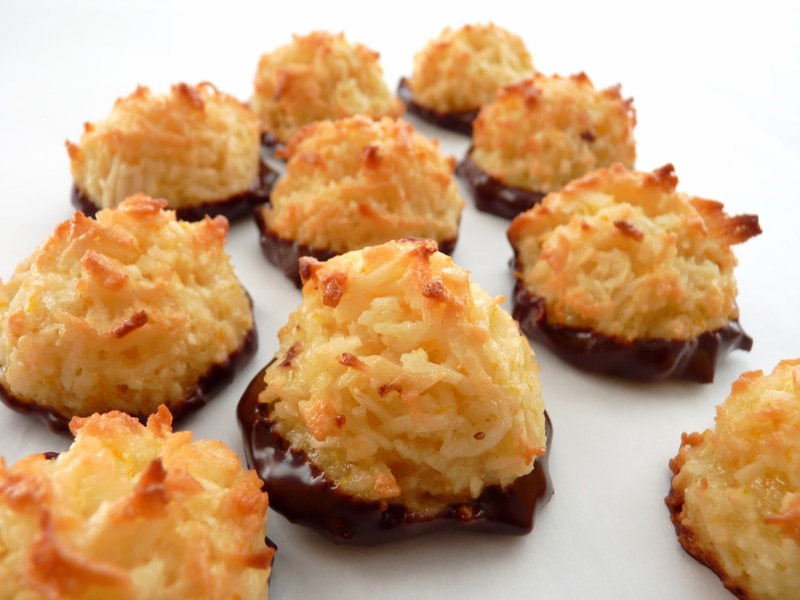 Some have called them macarons, and others have called them macaroons. Personally, I've always called them macarons but I was sure that there must be a difference between macarons and macaroons so I decided to look it up and share this little fact of the day with you guys! A macaron (correctly pronounced as MA-KA-HON [The letter R is silent in French]) is a sweet meringue-based confectionery made with eggs, icing sugar, granulated sugar, almond powder or ground almond, and food colouring. It is also called Luxemburgerli. The macaron is commonly filled with ganache, buttercream or jam filling sandwiched between two cookies. A macaroon is a type of light, baked confection, described as either small cakes or meringue-like cookies depending on their consistency. 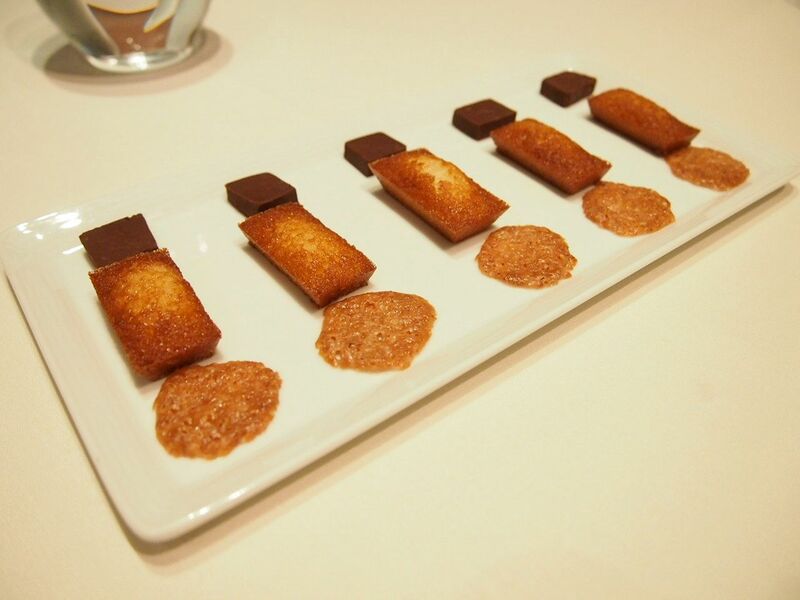 The original macaroon was a small sweet cake consisting largely of ground almonds similar to Italian amaretti. Speaking of macarons, Laduree is opening on Monday. 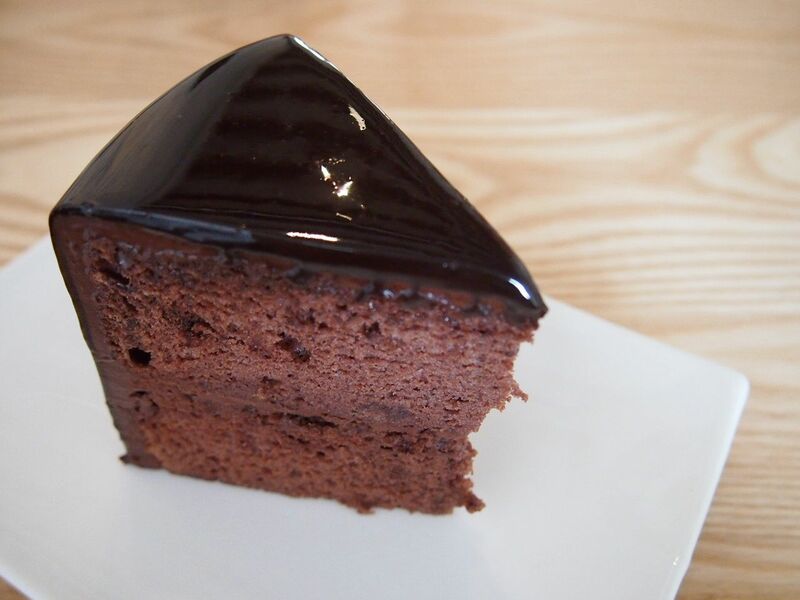 O M G.
Truffs has my favourite chocolate cake, forever and always. After Tom's Palette, Derrick, Nicole and I made our way to our second stop! Our destination was Sophie Bakery, which was closed for maintenance. What luck!!! We almost fainted due to the heat and disappointment haha. Thankfully, Truffs is just a few steps away! 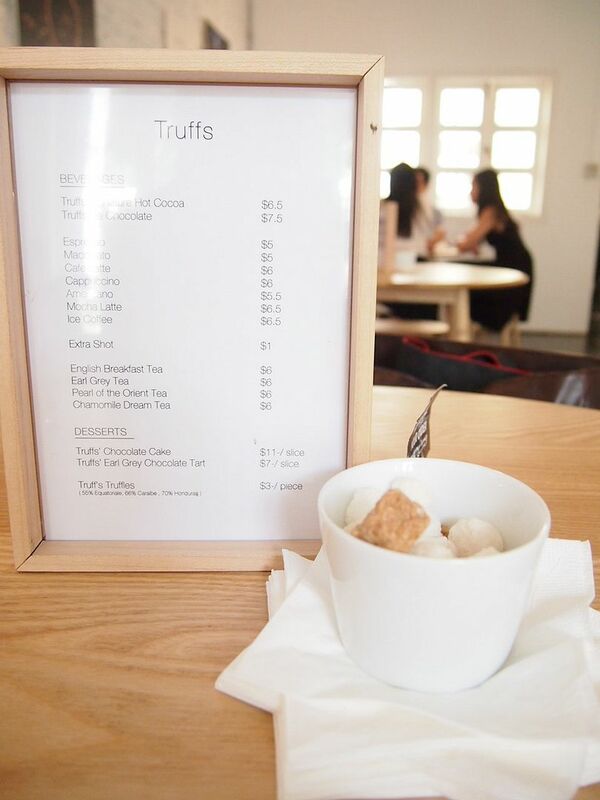 X and I have been wanting to visit Truffs ever since their new cafe was set up. 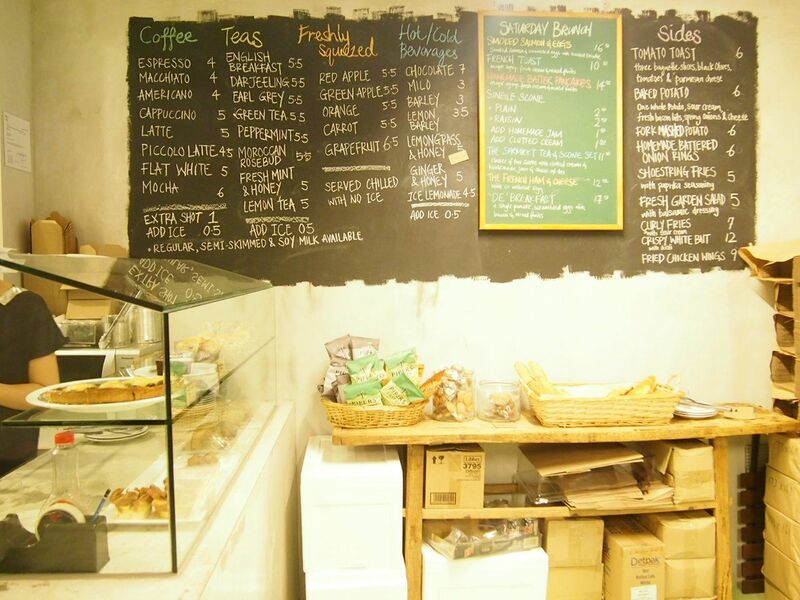 Truffs didn't use to have a cafe space. You could only go there to purchase and pick up truffles and cakes. 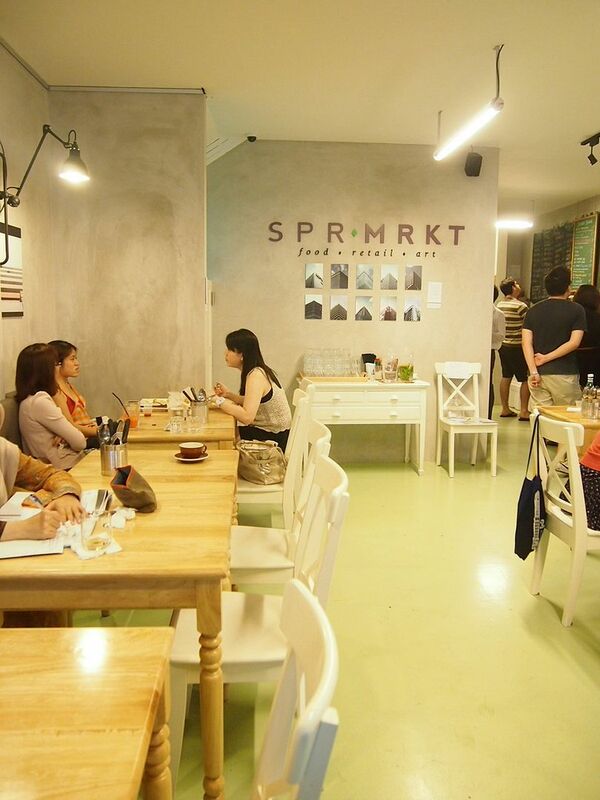 It's a brilliant move to finally have their own cafe! I bought two 3kg cakes($170 for one) from Truffs for my 21st birthday and everyone was asking me where I bought my cakes! I was so proud HAHAHA. 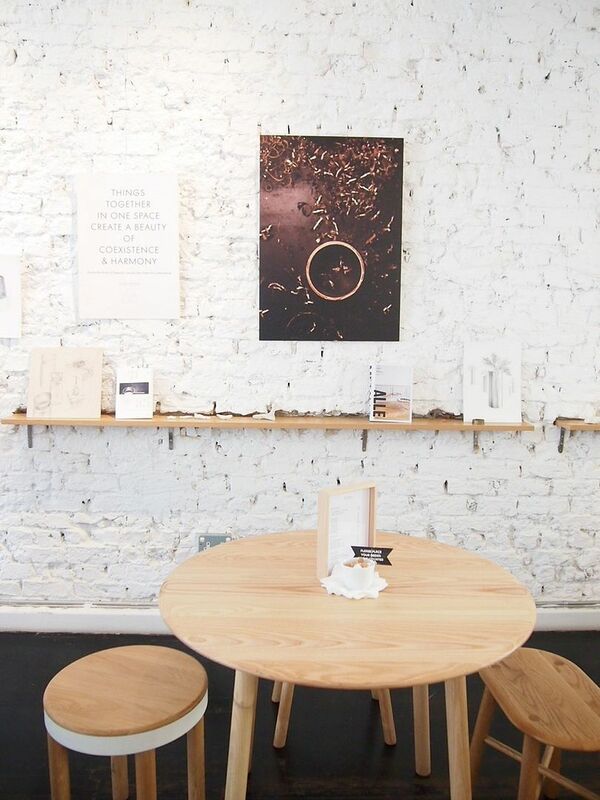 Here's revealing a pretty cafe that takes you away from the busyness of the city. I felt like I was in another country! Velvety smooth chocolate with dark chocolate bits. 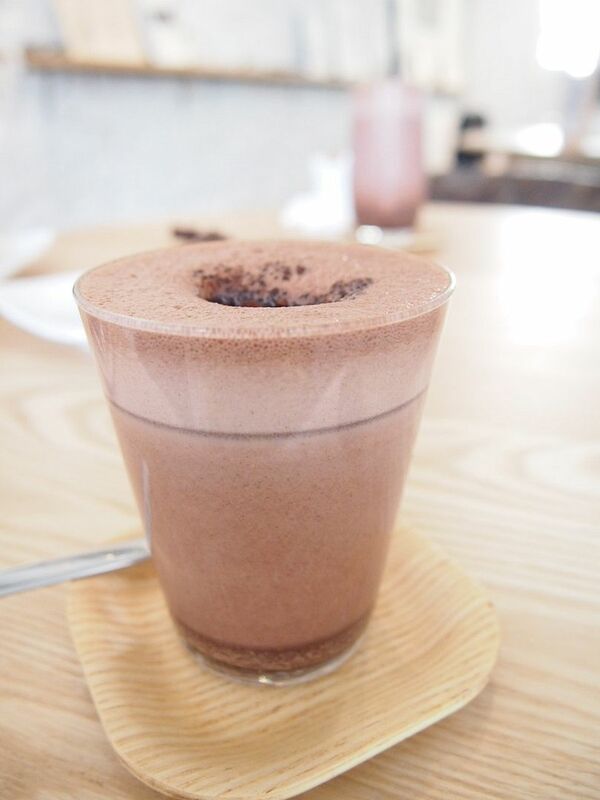 Best chocolate drink ever? Damn straight. I think this is sold at Five & Dime too! If I'm not wrong, I've had this there before haha. 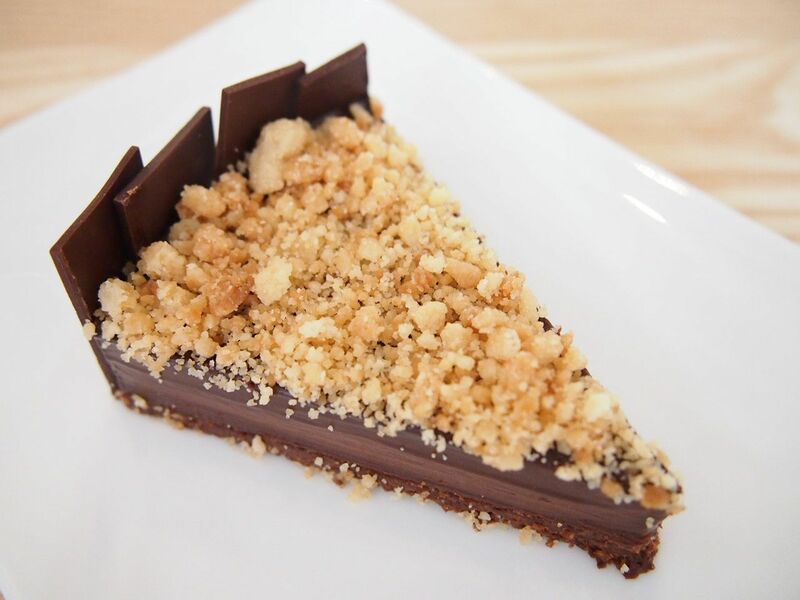 Very rich and smooth ganache carrying a subtle earl grey hint and topped with crunchy bits! Yummy! Having every mouthful melt slowly in my mouth is... indescribable. I don't know if I was being too sensitive or what but I felt that the cake tastes different?? But its still good of course! The fluffy light sponge just puts a grin on your face. It's not overly rich and you will never get sick of this cake! This tall cake has managed to get the delicate balance of ganache and sponge right! It's really the best chocolate cake in Singapore! Haha. It's a really good idea for Truffs to finally have a cafe and sell individual slices of their signature cake because if not, I can only eat it if I buy a whole cake! How my birthday cake looked like! 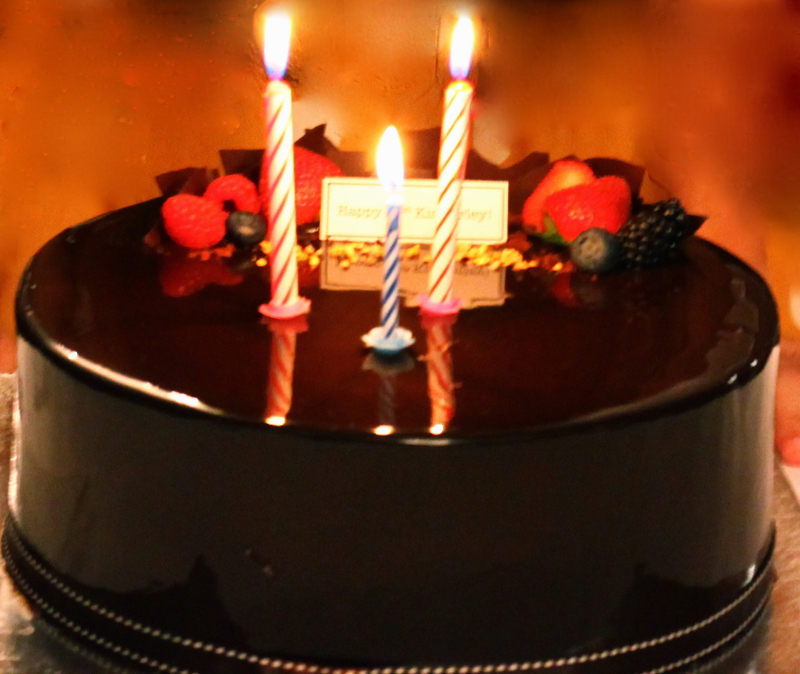 The glossy dark chocolate cake looks so perfect that it actually pained me to cut into it HAHA. After a very satisfying lunch at Gunther's, Derrick, Nicole and I decided to eat MORE. Haha, this is the first of our 3 destinations! Located not too far away and within walking distance is Tom's Palette, a very famous icecream shop. We went to Tom's Palette around 2 and it was pretty packed! It doesn't take long and much to notice how many people have been to this 8 year old icecream shop. 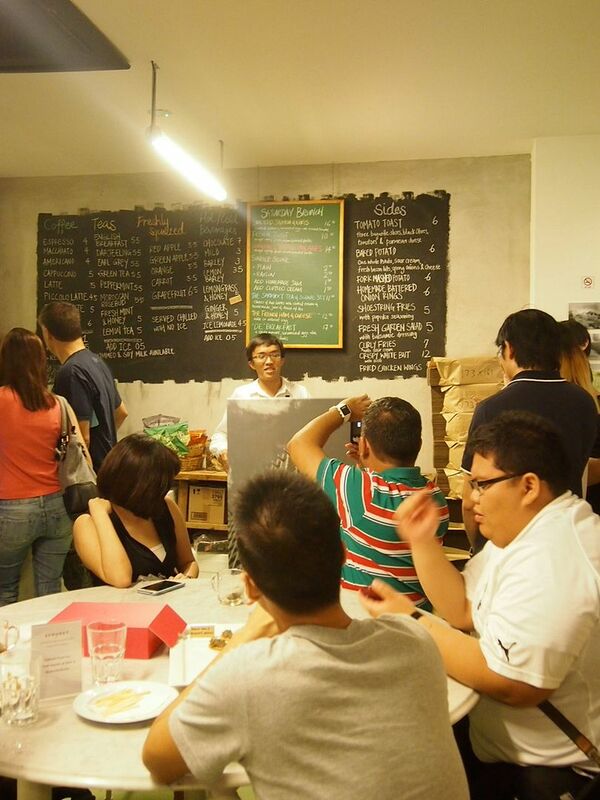 From all the photographs on the tables to the napkins on the board, I'm convinced that Tom's Palette is definitely one of Singaporeans' favourite icecream hangouts! 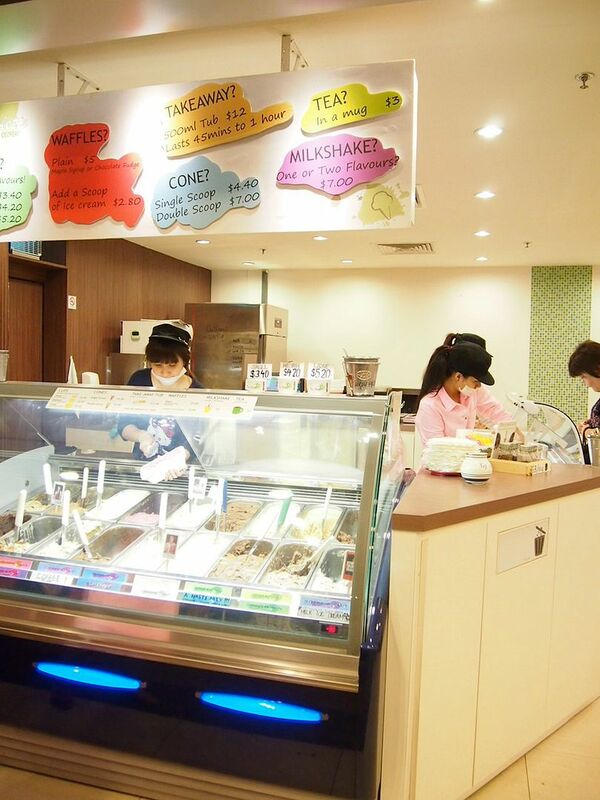 They have a really wide and unique selection of flavours like Salted Egg Yolk, Milk, Salted Caramel Cheesecake, Candy Crush etc. We had a really difficult time choosing. Nicole sampled like almost all the flavours hahaha. All of us had a cup of icecream each. Tom's Palette allows you to have two flavours even in their smallest cup! So I picked Salted Egg Yolk and Salted Caramel Cheesecake. The Salted Egg Yolk icecream was really yummy!!! 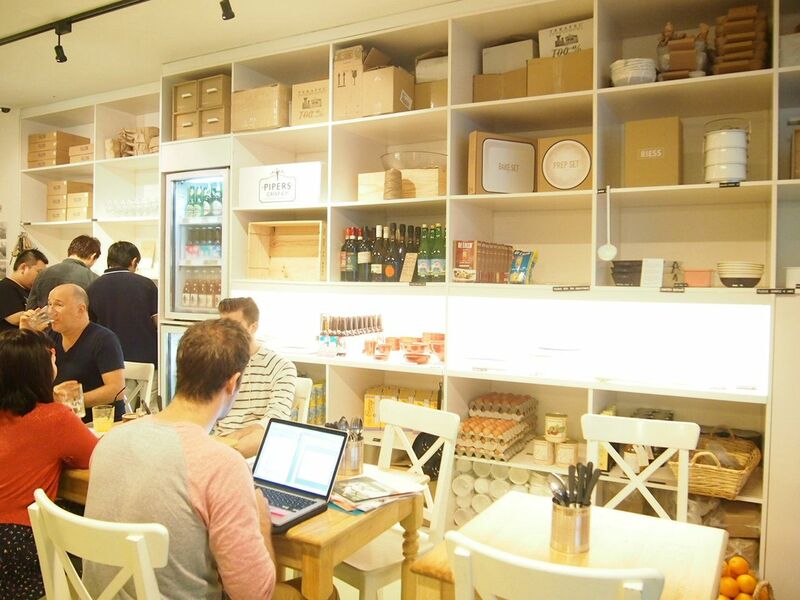 There's a 10% student discount for tertiary students from specific institutions! So it's like only $3 for 2 flavours in the smallest cup! Super worth it! X and I didn't make any reservations this Restaurant Week after having been to 8 places during the last 2 Restaurant Weeks haha. 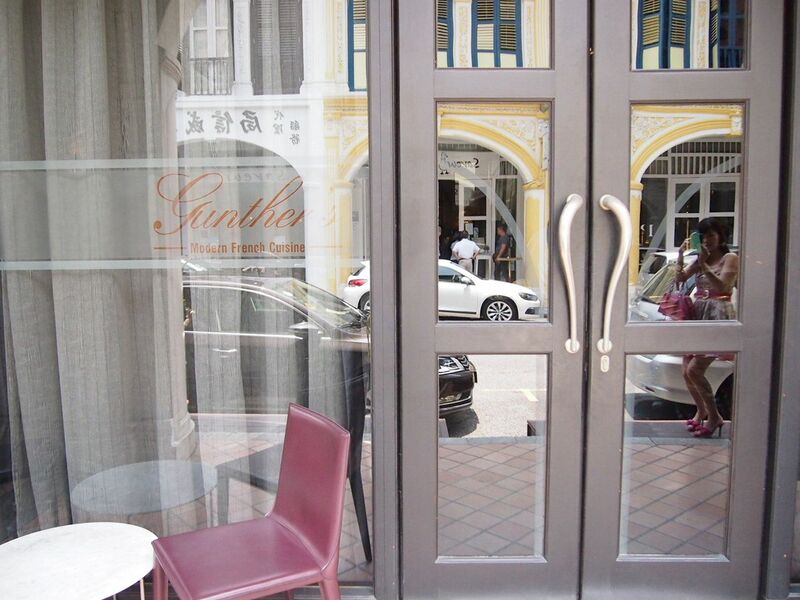 We have tried every restaurant that we wanted to except that I really wanted to go to Gunther's! Gunther's is new on the list and I wanted to go really badly but X was super busy during Restaurant Week ): BUT, thank God for fellow food bloggers! 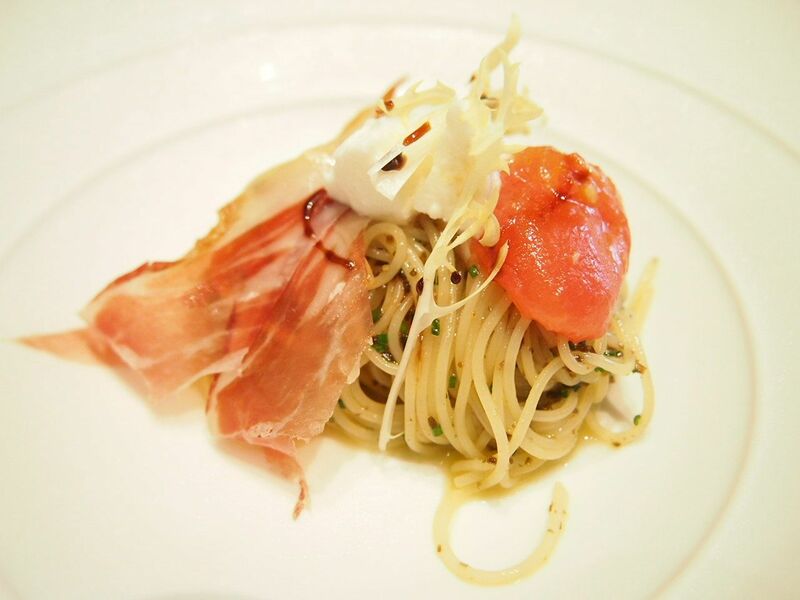 A simpler rendition of their signature Cold Angel Hair Pasta, Oscietra Caviar. 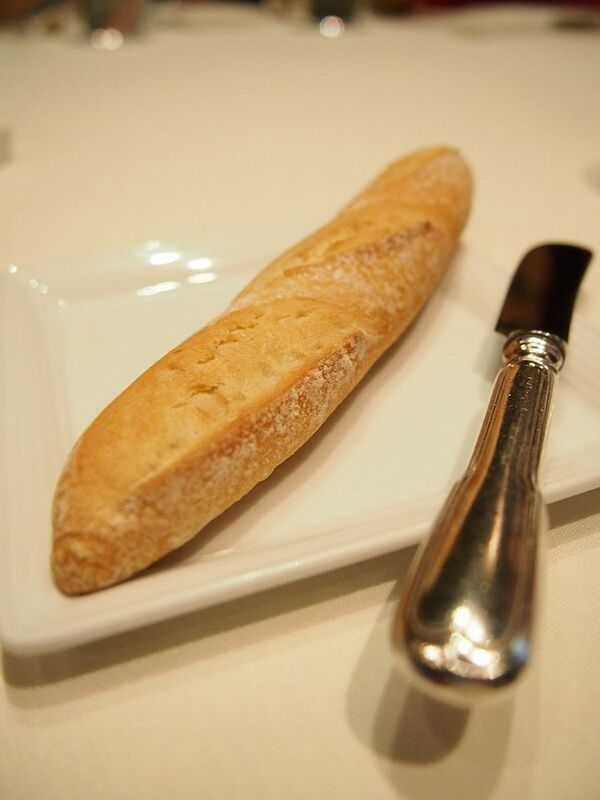 Even without the caviar, this dish was delicious right down to the last strand. Cold and springy pasta with paper-thin savory ham and chewy small blocks of mozzarella, heaven was never closer. Quite a generous portion for a starter but it was definitely insufficient! We were all craving for more! Top quality beef that not everyone will take too. It's too raw for me but Derrick loved it! 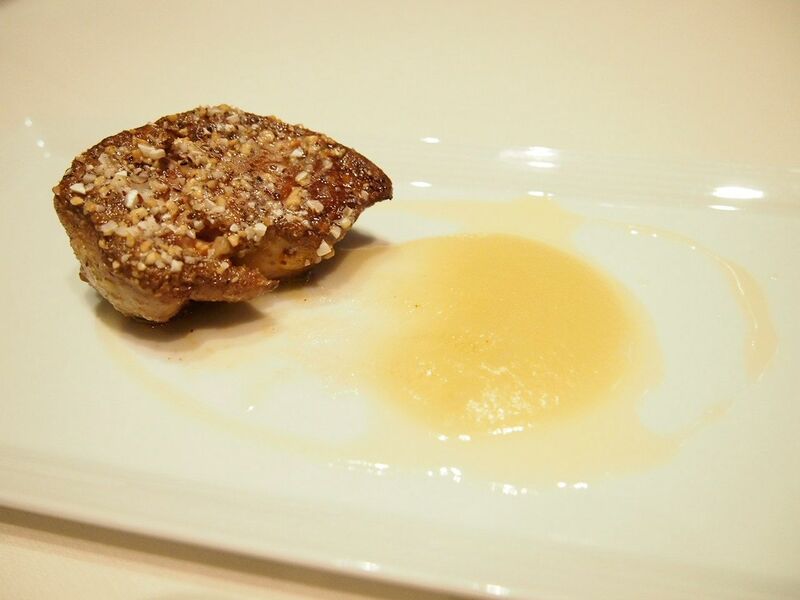 Perfectly roasted and tantalizing foie gras that is topped with crunchy almond bits. 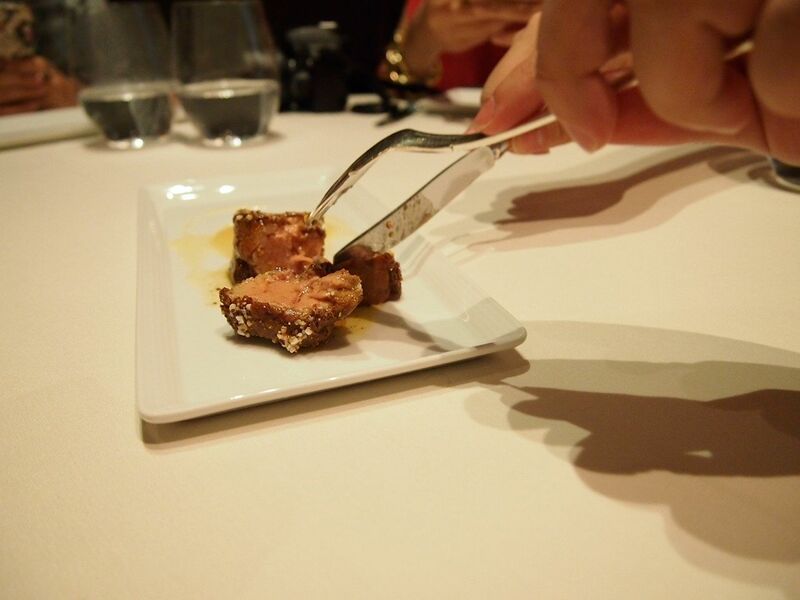 The almond complemented the roasted foie gras so well and enhanced the taste of the lightly crisp and melt-in-your-mouth slab of happiness. 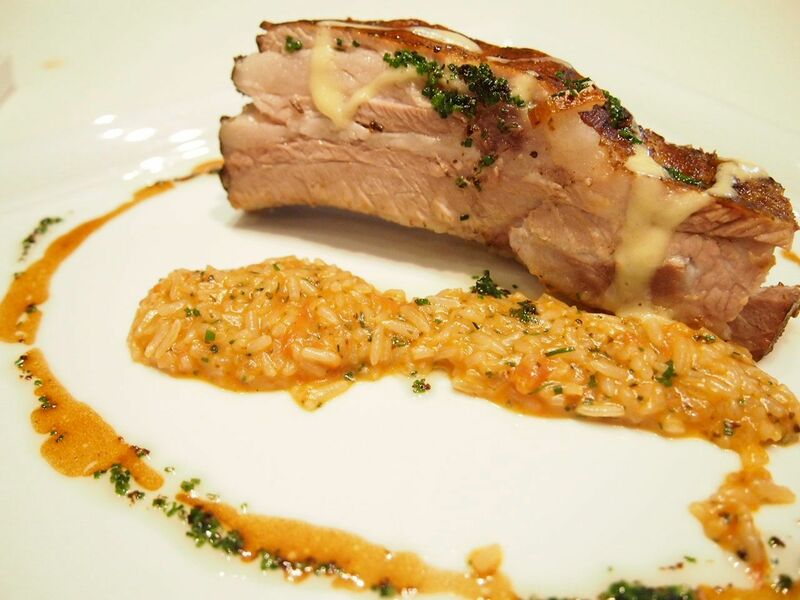 A giant piece of pork rib coupled with extremely delicious tomato omu rice. The tomato omu rice was rich and tasty with hints of spices that do not overwhelm your tastebuds. Every bite of the pork rib was joy and you really can't help but relish it. Brilliant and impeccable. 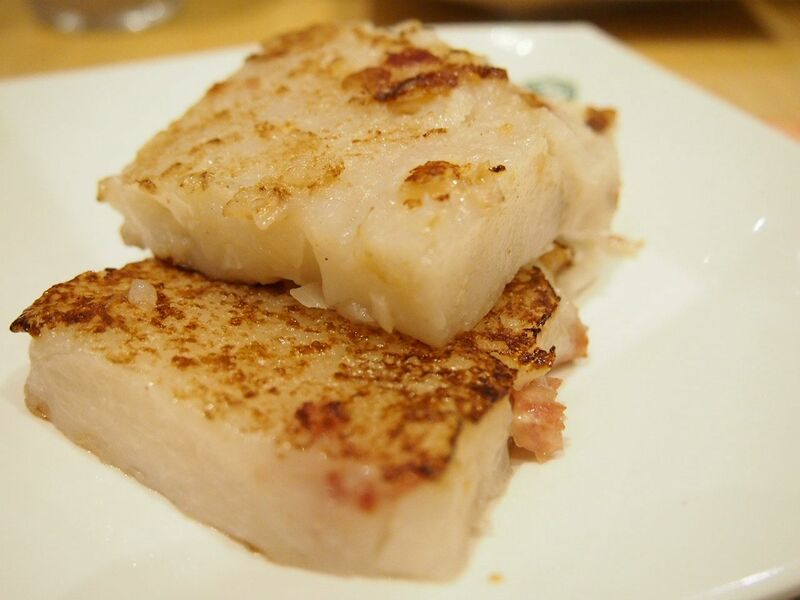 The cod fish pales a little in comparison to the pork ribs in terms of its portion and taste. The fresh cod fish was delicious with the creamy mushroom based sauce that it was partnered with. It does not leave as strong an impression as the pork ribs though! 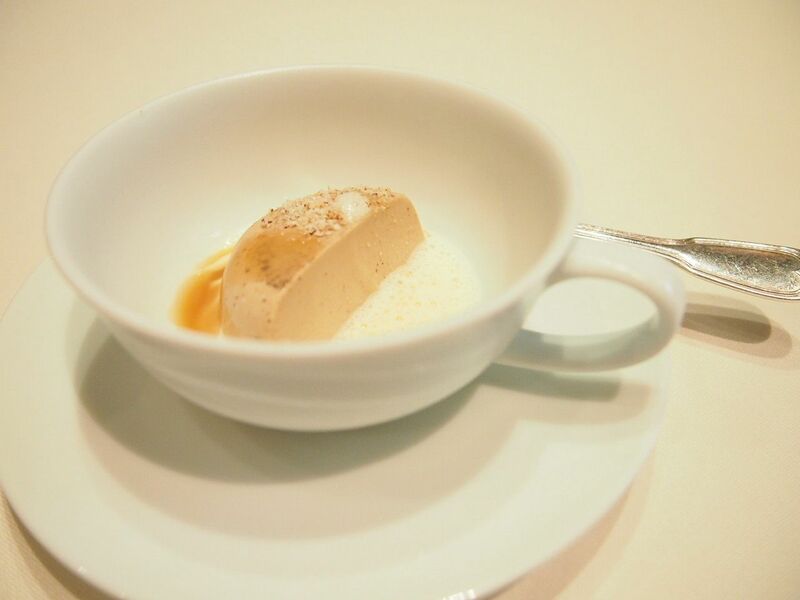 The pudding like Bavarois sits in a lemongrass infused sauce that tasted a little too strong on its own but was immaculate with the bavarois and the oh-so-good salty caramel. I took really long to eat this as I savoured every mouthful. Pure goodness. Gunther's is incredible, superb and just downright impressive. 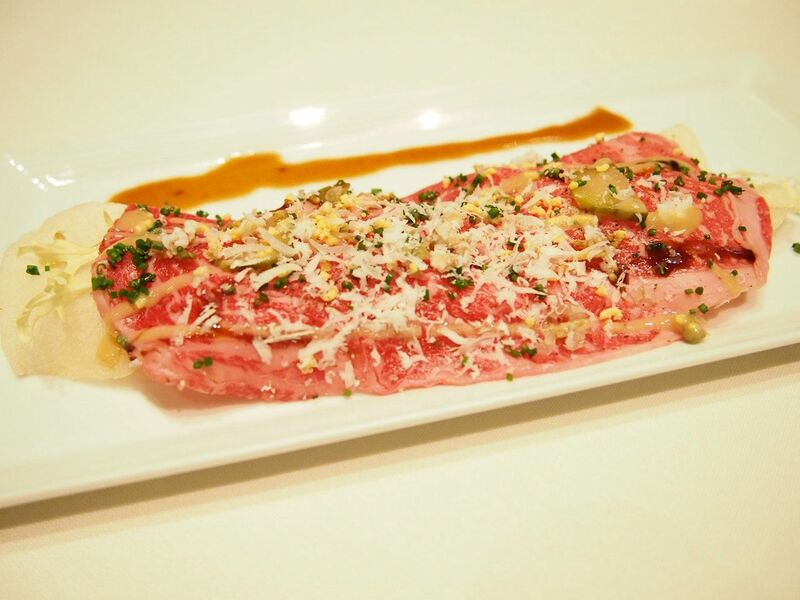 They're elaborate in every aspect, from the plating to service. For the cold angel hair pasta, the dish that it was served in was cold. The pasta was, thus, kept at its optimum temperature for consumption. 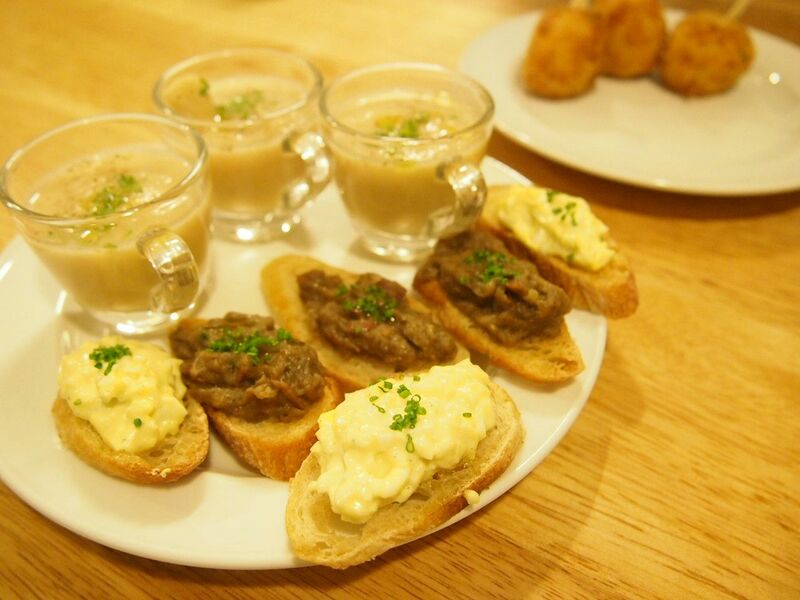 For the pork ribs and bavarois, the dishes were warm. I was really impressed! 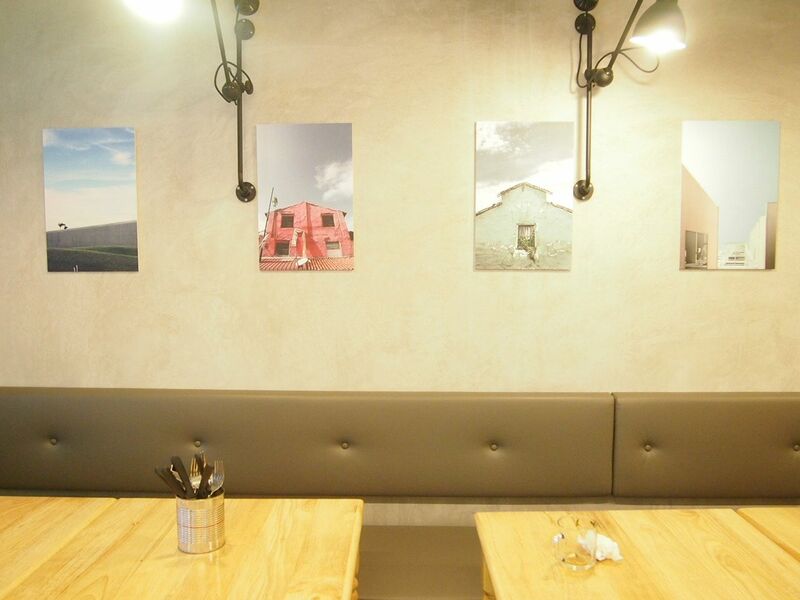 The restaurant is cozy and unpretentious with a smart casual dress code. And service was top-notch. The chef also spoke to us personally asking us how we found the food. We were initially told that we only had an hour to dine but the dishes weren't served all that quickly so the meal was extended but we never felt pressured to rush into our food. 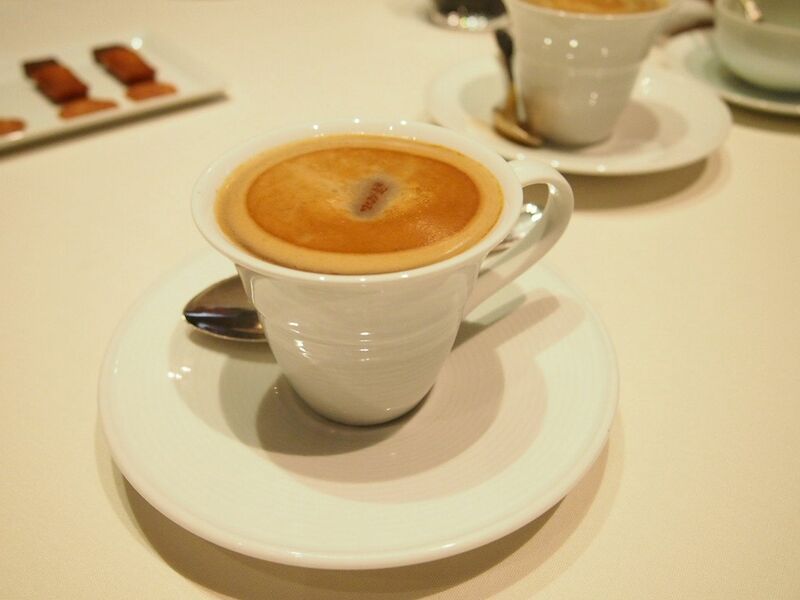 It was truly a wonderful dining experience!